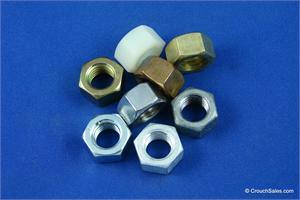 Hex nuts are available in coarse thread (NC) and fine thread (NF) and a variety of alloys such as zinc plated and plain low carbon, stainless steel, galvanized and brass including grade 8 nuts coarse, grade 8 nuts fine, zinc plated nuts coarse, zinc plated nuts fine, stainless nuts coarse, stainless nuts fine, galvanized nuts coarse, brass nuts coarse, nylon nuts coarse, zinc plated machine nuts, and stainless machine nuts. Grade 8 hex nuts course thread are yellow zinc plated hardened nuts available in 1/4-20 thru 2 1/2"-4 diameters and commonly used with Grade 8 course thread hex bolts. Stainless steel machine screw hex nuts are commonly used with stainless steel machine screws and are available in 0/80 thru 12/24 threads. Machine screw hex nuts zinc plated are commonly used with zinc plated machine screws and are available in 2/56 thru 3/8-16 threads.